Nasa is getting ready to throw a Mini Cooper-sized mobile science lab up into space. Curiosity, as the rover is affectionately called, is headed toward Mars with a payload of lasers and mass spectrometers and multi-million dollar robotic drills—basically all the stuff needed to prove fourth planet conditions are capable of supporting microbial life… conditions depending, of course. But in order for Curiosity to even get the chance at an alien discovery, it can't show up dressed as a multi-million dollar fireball. Nasa engineers started brainstorming how exactly to land their lab in 2003, and they quickly found themselves up against three big barriers to safe entry. The first: the rover's size. At nearly 2000 pounds, it is much bigger than any of Nasa's previous Mars-bound rovers. Second: Engineers know roughly where touchdown will take place, but they have no idea what kind of boulders, craters or other uneven ground is waiting there. An unexpected rock should make the mission, not tip the whole thing over. 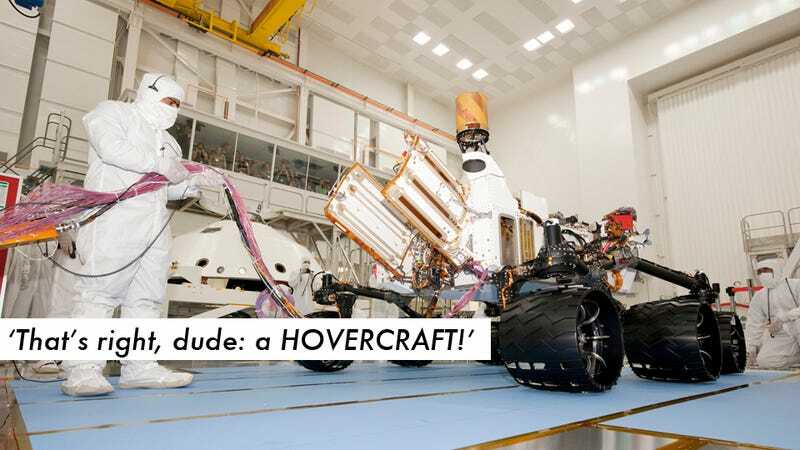 Third: Rovers typically land on a platform that they have to dismount upon arrival. If the egress is too steep due to a hill landing, for instance, the whole mobile lab could go wheels over instruments. Proven technologies didn't stand up to the present challenge. They thought about landing the thing on a platform with legs—a technique that goes back to the Surveyor and Apollo programs in the 1960s. When the rover is ready to explore, all it has to do is navigate a ramp before driving away. The idea seemed pretty straightforward, but when they sat down to crunch the numbers, there was a high probability that a hillside landing could topple the whole mission. "You travel millions and millions of miles to get to Mars. Your rover's ready to start, but then it needs to get off of its own platform," explains Mars Laboratory lead engineer Tom Rivellini. "And that turns out to be just as risky as getting all the way to the surface." Second generation systems in the Mars Exploration Rover and Mars Pathfinder missions used fixed-thrust solid rocket motors right before touchdown and an airbag to absorb the final impact. Unfortunately, neither would work here. "We tried wrapping air bags around it, which had been very successful previously," says Rivellini, "but it was just too big." Legs and airbags were out. "Rover on a rope" came up in one of those brainstorming sessions where outlandish ideas are given play in order to rule them out. The idea was this: they would hang the rover on cables below a throttleable rocket, which would ease the rover down at ¾ meters per second to the ground. You get that? Like a helicopter lowering a secret agent down to a rooftop in an action movie, a computer controlled jet pack would lower Curiosity to the Mars surface. Did I mention that the rover also lands blind? Oh yeah, the only thing making the decisions during the landing is a supercomputer on the hovercraft, which plummets to its electronic end (after flying away from the landing area) once changes in the up-force signal that the rover has touched down. It certainly sounded crazy, but after a bit of thinking and modeling, the whole team fell in love with it. The sky crane landing system (the name that replaced "rover on a rope") allows the lab to hit the ground rolling. Eliminating the ramp descent gets rid of a huge percentage of the tipping risk. When on the ground, Curiosity is hard to tip over; its six wheels are spread wide and have independent drive motors built for overtaking obstacles up to 30 inches high. The throttleable rocket-besides satisfying our love for all things jet pack-like—gives programmers more control over touchdown. After lots of modeling and a very tough independent review board, the idea was given the green light. Years of work and testing and review have gone into perfecting the 115 feet before Curiosity touches down on Mars. (There are several other things that happen-like a parachute opening and the spacecraft splitting in two—before the rover finds itself hanging from a rope). As Rivellini wrote in a National Academy of Engineering piece, "It's not the fall that kills you, it's the landing." Images and video courtesy NASA Jet Propulsion Laboratory.